If you have ever considered making your own handmade invitations, here are some tips to help you save time and avoid frustration. Handmade invitations lend an air of elegance and personalisation to your occasion, even if you are on a budget. You can bypass the drudgery and concentrate on creativity by choosing the right designs and utilising low-cost shortcuts. You can often save even more by purchasing some materials in bulk. There are many reasons why you might think about making your own handmade invitations. Saving money tops many people's lists. This is especially true for wedding invitations, which have become notoriously expensive. Handmade invitations are a perfect way to aid your wedding budget because what you create can actually be more elegant and inviting than bespoke invitations purchased from a stationer. Weddings aren't the only occasions that can benefit from handmade invitations. Special birthday parties, christenings, anniversary celebrations and other special occasions can all benefit from a handmade touch. When choosing your design you should also consider the amount of labour involved. The more invitations you plan to make and send, the simpler your chosen design should be. An intricate design may look beautiful and fit perfectly with your theme, but making 200 of them may be an impossible task. To make your own basic handmade invitations, you could start with some pre-folded blank cards. These can be bought from art shops or specialist stockists. Remember, if you've got a design in mind, keep it as simple as possible, especially if you're going to be producing a large volume of invitations. A great idea is to use a stamp - rubber or handmade - or a template or stencil. Flower designs are extremely versatile and can be used for wedding, christening or birthday celebrations. Alternatively, creating a design of simple shapes from handmade papers can also look effective. You can embellish your print or paper with beading, ribbon or a little glitter for that something extra. 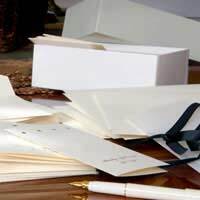 If you're not keen on hand writing inside each invitation, an alternative is to make paper inserts and use your computer to do the word processing. Choose a font that will suit the style of your invitation - sans serif fonts are more modern and funky, whereas italic fonts look more formal, delicate and decorative. Simply print out your inserts onto sheets of printer paper - the thicker, higher grade paper, the better - cut with a guillotine for a straight edge, and fold in half. To fix the insert, staple in the fold crease. If you're concerned about time and ability, you can find pre-made packs that you can assemble yourself. This option gives you a middle ground where you can save money over mass-produced invitations, while gaining the personal touch of handmade invitations. Using pre-made packs is an excellent way to save time as well. Regardless of how soon you begin, deadlines approach with unnatural speed. If you get behind on your invitations, you may end up without guests at your party. Depending on how many invitations you plan to make, you can also save money by purchasing some materials in bulk. A lot will depend on the design you choose. Once you have settled on the desired look for your invitations, find common elements and materials that can be purchased in bulk. This will maximise the savings you can achieve by doing the invitations yourself. Now you have some basic tips for making your own handmade invitations. Using handmade invitations for your special occasion can ease the pressure on your budget. However, the invitations themselves are often more highly cherished than their mass-produced counterparts. Choose your design wisely. Consider how many invitations you need and plan accordingly. You can save time with pre-made packs. Save money by purchasing in bulk whenever possible. The special occasions of your life will become even more special when you start them off with unique, personalised handmade invitations.